Medicare is a federal health insurance program regulated by the Centers for Medicare and Medicaid Services (CMS). The CMS is taking a step to protect Medicare beneficiaries from identity theft and Medicare fraud by removing Social Security numbers from Medicare cards. The CMS will assign all Medicare beneficiaries a Medicare Beneficiary Identifier (MBI) which is a unique number that contains a combination of numbers and uppercase letters. The CMS will issue and begin mailing the new cards in April 2018. All Medicare cards containing Social Security numbers are expected to be replaced by April 2019. As a member currently enrolled in a CalPERS Medicare health benefits plan, you don't need to provide CalPERS with your new card or MBI number. We will obtain your new MBI number directly from the CMS and update your account. No action is required from you for the transition to the new MBI number. If you are Medicare-eligible, receiving retirement health benefits, and not enrolled in a CalPERS Medicare health benefits plan, you will need to enroll in a CalPERS Medicare health benefits plan to continue your health coverage through the CalPERS Health Program. The Social Security Administration (SSA) oversees Medicare eligibility and enrollment. Initial Enrollment Period - When you're turning 65, you have a seven-month period to sign up for Part A and/or Part B. This Initial Enrollment Period begins three months prior to the month you turn 65, and ends three months after the month you turn 65. The date you sign up determines the effective date your Medicare coverage starts. General Enrollment Period - If you're not enrolled in Medicare, you have the opportunity to sign up for Part A and/or Part B during a three-month period each year. The General Enrollment Period begins January 1 and ends March 31. Your coverage begins the following July 1. Special Enrollment Period - If you and/or your spouse are currently working and covered by an employer group health plan from that current employer, you may be eligible to sign up for Part A and/or Part B during a Special Enrollment period. Contact the SSA for more information. A few months before you turn 65, CalPERS will send you notifications of the requirements to continue your health coverage. The notifications request information about your eligibility or ineligibility to enroll in Medicare. Apply for Medicare by contacting the Social Security Administration (SSA). If you qualify for Medicare Part A at no cost because either you or your qualified spouse worked for 40 quarters in Social Security/Medicare-covered employment, you must also enroll in Medicare Part B as soon as you're first eligible. When you enroll in Medicare Part A and Part B two to three months prior to your 65th birth month, CalPERS will work with the CMS to obtain your Medicare information and automatically transfer you from a CalPERS Basic (non-Medicare) health plan to a CalPERS Medicare health plan. If CalPERS is unable to obtain your Medicare information from CMS, you'll need to complete and submit the Certification of Medicare Status (PDF) form to CalPERS with copies of supporting documentation for manual processing. If you're ineligible for Medicare Part A at no cost, or if you're deferring enrollment in Medicare Part B due to current working status and covered under an employer group health plan, you must complete the Ineligibility of Medicare Certification (PDF) form. Submit the Ineligibility of Medicare Certification form to CalPERS with copies of supporting documentation prior to your 65th birth month to prevent cancelation of your CalPERS health coverage. You may remain in a Basic (non-Medicare) health plan if you're ineligible for Medicare. Review your CalPERS 2018 Medicare Plan Options (PDF). Transitioning from a Basic (non-Medicare) health plan into a Medicare health plan is an opportunity to change health plans. Not all Basic (non-Medicare) health plans have a corresponding Medicare health plan available. You may request to change health plans when you provide your Medicare eligibility information. If you do not choose a Medicare health plan, CalPERS will automatically enroll you in a Medicare health plan. For next steps, view the Transitioning to a Medicare Health Plan section below, and visit Medicare Plan Changes. If CalPERS is unable to obtain your Medicare information from the CMS and cannot automatically enroll you in a CalPERS Medicare health plan, you must certify your Medicare status to continue your CalPERS health coverage. If you do not meet these requirements, you'll receive a notice of cancelation of health coverage for yourself and all enrolled dependents the month you turn 65. Your CalPERS health coverage will automatically be canceled the first day of the month after you turn 65. See Cancelation of CalPERS Health Coverage for information on reinstating your health coverage. You must include supporting documentation such as a copy of the Social Security statement or letter from the SSA indicating that you're not eligible for Medicare based on your work record and/or the work history of a current, former, or deceased spouse. You may remain in a CalPERS Basic (non-Medicare) health plan until you later become eligible for Medicare Part A at no cost. If you later become eligible for Medicare Part A at no cost, you'll no longer be eligible to remain in a Basic (non-Medicare) health plan. To continue CalPERS health coverage, enroll in Medicare Part A and Part B, provide documentation of enrollment to CalPERS, and transition to a CalPERS Medicare health plan. You're still working and have active employer group health coverage. Your spouse is still working and you're covered under their active employer group health coverage. You must provide supporting documentation showing proof of enrollment in an active employer group health plan through the current employer. Once this information is received, you may remain in a CalPERS Basic (non-Medicare) health plan until retirement or until you lose your active coverage in the employer group health plan. If you later retire or lose your employer group health coverage through active employment, you'll no longer be eligible to remain in a CalPERS Basic (non-Medicare) health plan. To continue CalPERS health coverage, enroll in Medicare Part A and Part B, provide documentation of enrollment to CalPERS, and transition to a CalPERS Medicare health plan. The SSA will allow you to enroll in Medicare Part B without a late-enrollment penalty if you're eligible to enroll during a Special Enrollment period. 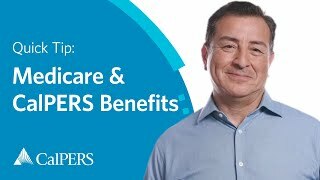 If your CalPERS Basic (non-Medicare) health plan coverage is canceled because you did not provide supporting documentation to meet the requirements to continue your CalPERS health coverage after age 65, you can request reinstatement of your health coverage within 90 days of your cancelation. In your request for reinstatement, you must provide supporting documentation from the SSA. You may also request re-enrollment through an administrative review process after 90 days of the date the coverage is canceled. If your coverage isn't reinstated, you may re-enroll during the annual Open Enrollment period by providing a completed Certification of Medicare Status (PDF) form along with the required documentation. The SSA establishes a Medicare Part B premium amount annually. Each month you must pay the monthly Medicare Part B premium to the SSA to remain enrolled in Part B. If you receive SSA benefits, the Part B premium will be deducted from your SSA benefits; otherwise, the SSA will bill you quarterly. The standard Part B premium amount applies to most people; however, you may pay an Income Related Monthly Adjustment Amount (IRMAA) if your modified adjusted gross income reported on your IRS tax return is above a certain amount. Once you're enrolled in a CalPERS Medicare health plan, you must continue to pay the SSA for Part B and maintain enrollment in Part B to remain enrolled in the CalPERS health program. If you're Medicare eligible and terminated from Medicare Part B by CMS, you'll be disenrolled from a CalPERS Medicare health plan and you may not be enrolled in a CalPERS Basic (non-Medicare) health plan; therefore, you may lose your CalPERS health coverage. If you're terminated from Medicare Part B, you must contact CalPERS immediately to resolve any enrollment issues and overpayments for Medicare Part B reimbursements. When you turn 65, you're eligible to enroll in Medicare Part B. If you do not enroll in Part B when you're first eligible, you may be subject to the federal late enrollment penalty. The late enrollment penalty is added to your monthly Part B premium for as long as you have Part B. You may also be subject to the late enrollment penalty if you voluntarily terminate your enrollment from Part B and enroll in Part B at a later date. If you're a state or California State University (CSU) retiree (some exceptions apply - pursuant to Government Code 22879), you may be eligible for a reimbursement of all or part of your Medicare Part B premium. If you're eligible for a Part B reimbursement, the amount is limited to the difference between your employer contribution and the cost of your plan's premium, up to the amount of the standard Part B premium. Your reimbursement will be automatically calculated and will appear on your retirement warrant as a credit. Each year when the federal government announces the standard Part B premium, CalPERS will reset the standard Part B premium for the new year based on the standard amount established by the federal government. Each year your Part B reimbursement will be adjusted based on the new year's standard Part B premium. If you disagree with the Part B reimbursement, you will need to provide to CalPERS supporting documentation from the SSA that confirms the amount that you pay for the standard Part B premium (not including any late enrollment penalties, fees, or interest). CalPERS will review the SSA documentation to make a determination of the correct Part B reimbursement. If you're terminated from Medicare Part B and no longer paying Part B premiums to the SSA, you must contact CalPERS immediately regarding your termination. If you receive reimbursement for Part B premiums on your retirement warrant for months that you did not pay Part B premiums to the SSA, CalPERS will invoice you for the overpayment of Medicare Part B reimbursements. California law does not provide for reimbursement of Medicare Part B premiums for retirees of contracting public agencies. If you're retired from a contracting public agency, you may contact your former employer to ask if this benefit is provided to you. If you pay an IRMAA for Part B, you may also pay an IRMAA for Part D. California law does not provide for reimbursement of Medicare Part D premiums. When you retire, become Medicare eligible, and enroll in Medicare Part A and Part B, you'll have the option to choose a new Medicare health plan. If you do not choose one, CalPERS will enroll you in a CalPERS Medicare health plan. Your current health carrier does not offer a CalPERS-sponsored Medicare health plan CalPERS will enroll you in the UnitedHealthcare (UHC) Group Medicare Advantage PPO Plan. CalPERS requires all family members to have the same health carrier. A combination plan means at least one family member is enrolled in a Medicare health plan and at least one family member is enrolled in a Basic (non-Medicare) health plan through the same health carrier. Consider your family's needs when determining which Medicare health plan is right for you. If you or your family member become eligible for Medicare and enroll in a CalPERS Medicare health plan, all members of your family will be impacted by the Medicare member's change in health plans. If the Medicare member enrolls in the UHC Group Medicare Advantage (PPO) Plan, the other family members must move to the UHC Basic Plan, SignatureValue Alliance (HMO). If the Medicare member enrolls in another available Medicare plan, such as Kaiser Permanente Senior Advantage, the other family members will be enrolled in the Kaiser Permanente Basic Plan. Medicare members will be enrolled in UHC Group Medicare Advantage (PPO) Plan. Family members enrolled in a Basic (non-Medicare) health plan will be enrolled in UHC SignatureValue Alliance HMO Basic Plan. Your health eligibility ZIP code area is outside UHC's service area Your family members in Medicare and Basic (non-Medicare) health plans will be enrolled in PERS Choice PPO Plan. Search the UHC SignatureValue Alliance HMO Network or call (877) 359-3714 to find out if UHC accepts your or your dependent's current providers. If not, and it's a priority to keep your or your family members' current providers, you may consider enrolling in one of CalPERS PPO Plans (PERSCare, PERS Choice, or PERS Select). Both the Medicare and Basic Plans are PPOs, which will allow all family members to retain their current providers but may result in higher costs. You can log in to my|CalPERS and use the CalPERS Find a Medical Plan tool to compare the costs and benefits of different plan options. If you're currently ineligible for Medicare Part A without cost in your own right, you may be or become eligible through a current, former, or deceased spouse's work history. If you're eligible through a spouse, you may apply when your spouse is first eligible to receive Social Security benefits, generally at age 62. Contact the Social Security Administration at (800) 325-0778 or TTY (800) 325-0778 to clarify your Medicare eligibility through a spouse. CalPERS participates in a Medicare Part D prescription drug plan for members enrolled in a CalPERS Medicare health plan. The standard Part D premium is paid through your CalPERS health insurance premium. If your income exceeds a federal threshold as determined by the SSA, you may be subject to an additional Income Related Monthly Adjustment Amount (IRMAA) for Part D prescription drug premiums. You'll either receive an invoice for the additional amount, or it'll be deducted from your Social Security benefits. Non-payment of the additional prescription drug premium will result in cancelation of your CalPERS health coverage. If you enroll in a CalPERS-sponsored Medicare Advantage Plan that includes Part D prescription drug coverage in its benefit package and you are subject to an additional Medicare Part D premium, you must pay the additional Medicare Part D premium, or your health coverage will be canceled. If you re-enroll at a later date, you may incur a federal late enrollment penalty. If you enroll in a CalPERS-sponsored Medicare Supplement Plan and a Medicare Advantage Plan that does not include Medicare Part D prescription drug coverage in its benefit package, you'll also be enrolled in a CalPERS-sponsored Medicare Part D prescription drug plan unless you notify the Medicare Part D prescription drug plan that you wish to opt-out of prescription drug coverage. If you decline coverage, you'll be responsible for all of your prescription drug costs. If you re-enroll at a later date, you may incur a federal late enrollment penalty. Do not enroll in a non-CalPERS Medicare Part D plan. If you do so, CMS will disenroll you from your CalPERS-sponsored Medicare Advantage Plan or Medicare Part D prescription drug plan resulting in cancelation of your CalPERS health coverage and you'll be responsible for your prescription drug costs. If you're Medicare eligible and you lose your Part A and/or Part B, you'll be disenrolled from the CalPERS Medicare health plan. Your disenrollment from Part A and/or Part B may result in cancelation of your CalPERS health coverage. CMS requires members to live in the approved plan service area and list a residential address. Post Offices Boxes are not permitted. If CalPERS is unable to verify your permanent residential address, your enrollment may be subject to cancelation, or you may be administratively enrolled in a Medicare Supplement plan to continue your CalPERS health coverage. CMS must approve your enrollment in a Medicare Advantage plan and Medicare Part D plan. CalPERS and/or your CalPERS Medicare health plan may contact you to obtain additional information required by CMS to complete your enrollment. If you're contacted for additional information, respond immediately to protect your health coverage. You may be enrolled in only one Medicare Advantage plan at one time, as well as one Medicare Part D plan at one time. If you're enrolled in a CalPERS Medicare health plan and later enroll in another Medicare health plan, you'll be disenrolled from the previous Medicare health plan. UnitedHealthcare (UHC) offers two health plan options for Medicare retirees from contracting agencies: a PPO plan with dental and vision, and a PPO plan without dental and vision. The PPO with dental and vision coverage is available to Medicare-eligible members not covered under their retirement benefits for an additional premium per Medicare member, per month. UHC will bill you directly for this amount. Kaiser Permanente Senior Advantage also offers two health plan options for Medicare retirees from contracting agencies: an HMO plan with a dental option and an HMO plan without a dental option. The plan with the dental option has an additional premium per Medicare member, per month. Delta Dental will bill you directly for this amount. You can make changes to your health plan outside of Open Enrollment due to a qualifying event, such as adding a dependent child, registered domestic partner, or new spouse. For more information about special enrollment opportunities, visit Retiree Plans & Rates or review the Health Program Guide (HBD 120) (PDF). The Centers for Medicare & Medicaid Services (CMS) has a National Mail Order Program for diabetes testing supplies that requires Medicare Part B members to use a Medicare contracted supplier. OptumRx Home Delivery Pharmacy is not one of the Medicare National Mail Order contract suppliers. This applies to diabetes testing supplies only and will not affect other items and prescriptions you currently fill through OptumRx Home Delivery Pharmacy, including oral medications for treating diabetes. If you have questions regarding your Medicare Part B coverage for diabetic supplies, call OptumRx Member Services at (855) 505-8106 (TTY users call 711). Representatives are available 24 hours a day, 7 days a week. Download the Printable Version of the OptumRx Letter (PDF). Read our Medicare Enrollment Guide (PDF) for more information about eligibility. Learn why you need to enroll in a CalPERS Medicare health plan and find answers to frequently asked questions. Can I continue my CalPERS Basic health plan coverage if I am Medicare eligible, retired from CalPERS, and returning to work? You may continue your enrollment in a CalPERS Basic health plan if you receive your health coverage through employment status and not as a retiree through retirement status, or if you're eligible to defer your Medicare enrollment. You may be able to defer Medicare enrollment if you're Medicare eligible and covered by an employer group health plan (yours or your spouse's). If you defer enrollment, you'll be able to enroll during a Special Enrollment Period after either your employment or your employer group health coverage ends. How do I switch to a CalPERS Medicare health plan after retirement? Sign up for Medicare Part B as soon as you qualify and read the Medicare Enrollment Guide (PDF) for more information. If I didn't pay the increased amount for my Medicare Part D insurance, what will happen to my CalPERS benefits? Immediately contact the Social Security Administration to see if you can reinstate your Medicare Part D, either without a lapse in coverage or on a prospective basis. Medicare Part D is your prescription drug coverage, and if you have lost your Medicare Part D enrollment, you will pay out of pocket for your prescription drug coverage. If you enroll in a non-CalPERS Medicare Part D prescription drug plan, you will lose all of your CalPERS health coverage. If I don't want Part B benefits, will this affect my CalPERS Medicare health plan? You must have Medicare Part B to participate in a CalPERS Medicare health plan. If you cancel or choose not to enroll in your Part B coverage, then you'll lose your CalPERS health coverage. If you don't sign up for Medicare Part B when you turn 65 and decide to sign up for it later, you may have to pay a federal Part B penalty surcharge. If you sign up later, you'll pay more for every month of your Part B coverage. Contact the Social Security Administration at (800) 772-1213 or TTY at (800) 325-0778 for more information about the Part B penalty surcharge. If I lost my CalPERS health benefits because I stopped my Part B insurance, how can I get them back? Immediately contact the Social Security Administration (SSA) to see if you can reinstate your Medicare Part B, either without a lapse in coverage or on a prospective basis. If this isn't possible, you can only enroll during SSA's annual General Enrollment period with an effective date of the following July 1. Some SSA offices will process your request outside of the General Enrollment period, but your effective date will still be the following July 1. You may request re-enrollment in a CalPERS Medicare plan based on the effective date of your Medicare coverage. What are the optional benefits offered by UHC for contracting agencies? UHC offers two health plan options for Medicare retirees from contracting agencies: a PPO plan with dental and vision, or a PPO plan without dental and vision. The dental and vision coverage is available to Medicare-eligible members not covered under their retirement benefits for an additional premium. For more information, see Optional Benefits for CalPERS Contracting Agencies.